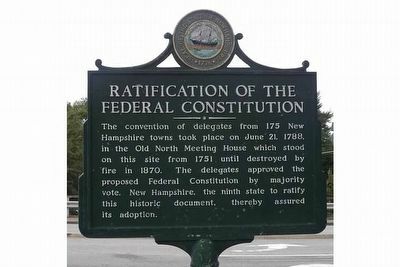 The convention of delegates from 175 New Hampshire towns took place on June 21, 1788, in the Old North Meeting House which stood on this site from 1751 until destroyed by fire in 1870. The delegates approved the proposed Federal Constitution by majority vote. 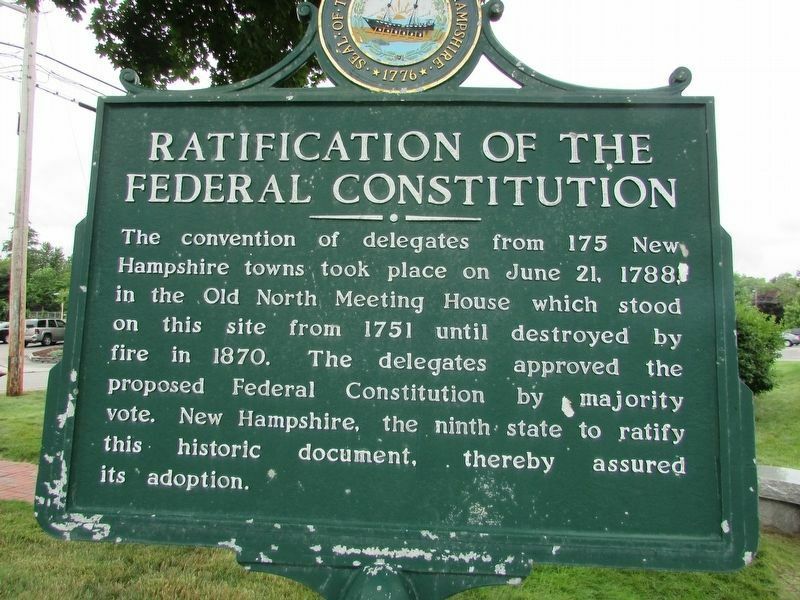 New Hampshire, the ninth state to ratify this historic document, thereby assured its adoption. Location. 43° 12.878′ N, 71° 32.505′ W. Marker is in Concord, New Hampshire, in Merrimack County. Marker is at the intersection of Bouton Street (U.S. 3) and Church Street, on the right when traveling south on Bouton Street. Touch for map. Marker is located in Nathaniel Bouton Park. 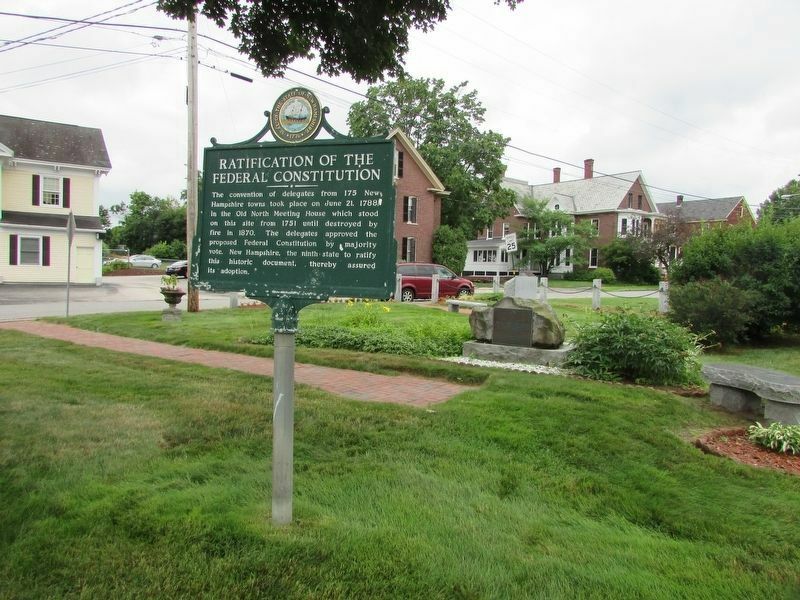 Also located in this small memorial park are the Walker School Marker and New Hampshire's First Meeting House Marker. The marker is on the grounds of the former Walker Elementary School which is now Binnie Media. 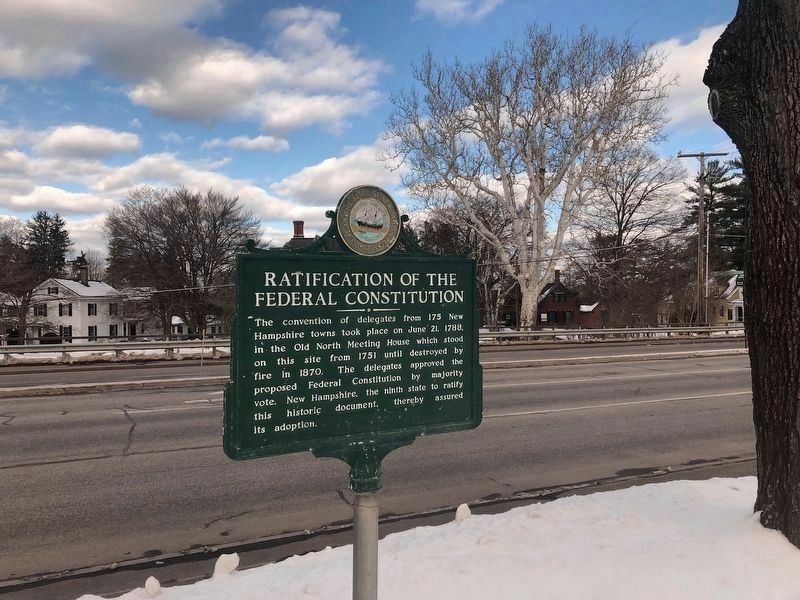 The marker is just west of Concord's Historic District. Marker is in this post office area: Concord NH 03301, United States of America. Touch for directions. within walking distance of this marker. New Hampshire’s First Meeting House (here, next to this marker); Walker School (a few steps from this marker); Walker School 1915 (about 300 feet away, measured in a direct line); Franklin Pierce (about 500 feet away); Site of House (about 500 feet away); The First Garrison in Concord (about 600 feet away); First Session of the Legislature at Concord (about 700 feet away); The Pierce Manse (approx. 0.2 miles away). Touch for a list and map of all markers in Concord. View of marker facing easterly toward historic North Main Street. Large white tree to the right of the marker is NH's largest American Sycamore and is over 17' in circumference. More. Search the internet for Ratification of the Federal Constitution. Credits. This page was last revised on February 20, 2019. This page originally submitted on October 14, 2015, by Barbara Bard of Hooksett, NH-New Hampshire. This page has been viewed 239 times since then and 21 times this year. Last updated on February 16, 2019, by Douglas Finney of Concord, New Hampshire, USA. Photos: 1. submitted on October 14, 2015, by Barbara Bard of Hooksett, NH-New Hampshire. 2, 3. submitted on July 13, 2017, by Bill Coughlin of North Arlington, New Jersey. 4. submitted on February 16, 2019, by Douglas Finney of Concord, New Hampshire, USA. • Andrew Ruppenstein was the editor who published this page.